Establishing an identity for Ruth, the wife of Captain John Roundy of Rockingham, Vermont, poses some difficulties. Her first name is shown in her husband's will, as well as in various Rockingham church and vital records. None show a maiden name. Several resources name Ruth Chickley or Chickerly as the wife of Captain John Roundy, who died in 1805. Three examples, spanning over 100 years, are: various lineage books of the DAR (and more recently, the organization's online patriot index), The Roundy Family in America, a 1942 book by Everett Ellsworth Roundy, and, The American Genealogist (TAG), vol. 43, page 179, published in 1966. TAG provides a marriage date for John Roundy to Ruth Chickley of 4 February 1768. Multiple researchers have posted variations of this data to online family trees, where it has become accepted as fact. Taking a second look, however, raises some questions. First, Ruth's birth year is often estimated at 1753-1755. This would make her age 13-15 at the time of her marriage. Certainly not unheard of, but perhaps young for New England? Secondly, where are the records, or even theoretical parents, for a Ruth Chickley or Chickerly? Results of searching for those names on Ancestry.com, FamilySearch.org, or the NEHGS website are slim to none. Even expanding the search to include the variations of Checkley or Chickering wasn't helpful. Not even unsourced pedigree charts offer any clues. The earliest Ruth Chickley I could identify was a married woman in the 1850 census. A lack of records wouldn't be surprising in most of the country, but in New England, the coverage is pretty good. At least something for a family member would be expected. However, intriguing pieces of data exist, which may offer an explanation. The Roundy family is known to have spent time in Beverly, Massachusetts, before resettling in Connecticut. A search there and in surrounding communities offers some results that can't be ignored. Among the marriage records of Marblehead, Massachusetts, is a marriage for a John Roundy to Ruth Devereux. The date? 4 February 1768. The asterisk next to it indicates an intention was also recorded. The John Roundy shown above him is the great-grandfather to the Captain of Vermont, at the time of his second marriage in 1707/08. Ralph Devereux Roundy, shown here. This differs by four years from the generally accepted earlier birth date of Captain John's son Ralph, but again, it's a baptism, not a birth. ﻿How do I explain the fact that Captain John and his father are both recorded as having been born in Norwich, Connecticut, and why would the son be in Massachusetts for his 1768 marriage? I don't have a quick answer. Perhaps it was simply a case of someone taking care of business or the affairs of family members, which required a trip between the two locations. Also, I have seen on several occasions a large family being recorded all at once in the local baptismal records, but all of the children hadn't necessarily been born in that location. Perhaps they just simply move back for a time. John and Ruth Devereux Roundy had four children recorded in Marblehead records: Ruth, 1771, Desire, 1774, John, 1775, and Ralph, 1778. Perhaps the Roundys kept closer ties to Massachusetts than we know. 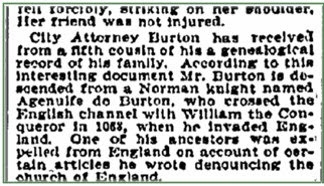 This family was clearly "on the move," if they were also thought to have been in Simsbury, Connecticut, before traveling on to Vermont. Being in motion might also explain why a CT birth record for daughter Sabra Roundy has been hard to locate. As for the name Chickley/Chickerly, it might be one of those "kernels of truth" situations: right date, wrong name. Because of the multitude of Roundys in the Marblehead area, one has to be careful about persons of the same name creating ancestral chaos. However, none of the John Roundys I could find among the records were the right age to be living a "parallel life" to the Captain. The same is true of the Ruth Roundys married to a John. The good news in all of this is that the Devereux/Potter and allied families are well-documented in the area; there is a voluminous amount of information available. Having recently been on the ground in Massachusetts, I can tell you that the relevant communities are very close together. The distance between Beverly, Marblehead, Salem, Swampscott, and Lynn is actually a total of about nine miles. ﻿A page detailing the Potter family of Marblehead, Essex County, Massachusetts, shows the children of Ruth Potter and her first husband, Ralph Devereux. Note the daughter, also named Ruth, baptized 15 January 1743/44, is shown to have married John Roundy on 4 February 1768. She would have been 24 when she got married. Image reproduced in the The Essex Genealogist, Vol. 19, page 151, published in 1999. I accessed this source via the New England Historic Genealogical Society's website: AmericanAncestors.org. Have I proven beyond a doubt that the Ruth Devereux Roundy of Marblehead eventually moved to Vermont? Probably not. Further research might provide more clues. However, I keep asking myself a simple question, "How many John and Ruth Roundys are associated with a marriage date of 4 February 1768, who had a son named Ralph?" Bragging about ancestors, real or imagined, is certainly nothing new. Recently, while doing some newspaper research, I came across the following item. It was published in the Sioux City (Iowa) issue of Thursday, February 27, 1896, in a column entitled, "Jottings About Town News Briefs." This was a collection of miscellaneous items that didn't rate separate articles. So many thoughts are generated by this small piece. The date of the Conquest appears to be something other than 1066, which is unfortunate. Is the reporter's use of the word "interesting" meant to be ironic? How was the city attorney identified and located by his "fifth cousin?" And, lastly, was this "genealogical record" acquired by means of a subscription letter asking for a fee? After all, you wouldn't expect anything less than a Norman knight for your money, would you? Or, perhaps the knight really did leave a descendant in far-off Iowa, toiling away at the courthouse!